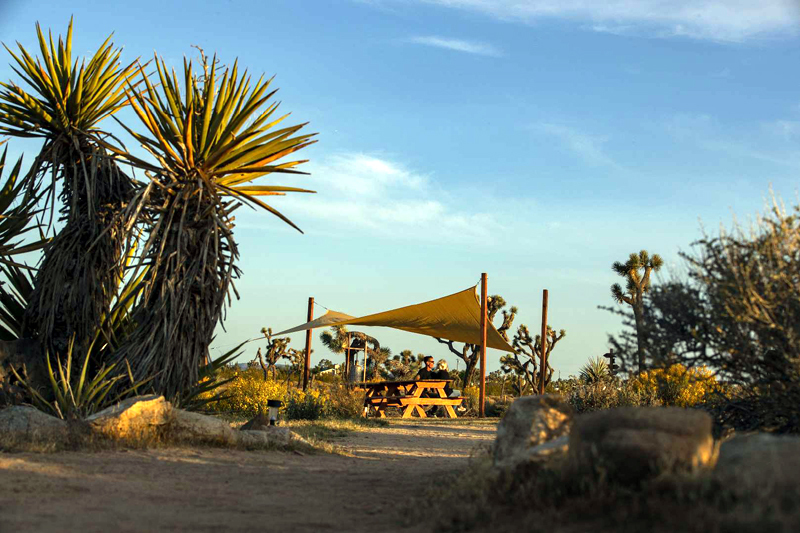 Lazy Sky Retreat has outdoor showers, a communal kitchen and tepees on May 15, 2018, in Joshua Tree, Calif. The tepees are spacious tents with electrical outlets, Western decor and doors facing the rising sun. Lazy Sky is just one of Joshua Tree's estimated 800 unlicensed vacation rental businesses offering a menu of quirky alternatives to traditional motel lodging: neighborhood homes, vintage trailers, Sherpa huts, tepees, shipping containers, or simply slabs of cement on which to pitch a tent or park a vehicle. "I used to sit out on the porch and watch bobcats creep past under skies filled with stars, bats and owls," he said. "Neighbors knew each other and kept an eye on each other's property." But over the past two decades, this otherworldly landscape has gone from a destination for hikers and rock climbers to an international attraction luring 3 million visitors per year - overwhelming the area's craggy campsites, low-slung motels and Grden's once-sleepy community. "Now I'm surrounded by Airbnbs filled with vacationing strangers who seem to think anything goes out here," he said, shaking his head. The unincorporated high desert community of Joshua Tree has a population of about 9,000 and an estimated 800 unlicensed vacation rental businesses offering a menu of quirky alternatives to traditional lodging: neighborhood homes, vintage trailers, Sherpa huts, tepees, shipping containers and camps where guests are encouraged to let their dogs run free while they sip cocktails and watch the sunset. There are the patches of concrete on which to pitch a tent or park a vehicle that critics say are rented out by "slab lords." It is illegal to operate a nightly rental in unincorporated San Bernardino County, but there are no enforcement codes governing the practice, officials said. With such high demand and nearly no risk of punishment, property owners are rushing to get in the market. But the onslaught of short-term rentals is creating a widening rift among residents, pitting neighbor against neighbor in tense disputes about bad behavior, loud music, 3 a.m. volleyball parties, rampant trespassing, unleashed dogs, drones, piles of garbage and a discomforting lack of housing available for traditional long-term leases. The tensions play out at community gatherings, on social media and in heated arguments that break out in local cafes and supermarkets. Vacation rentals have stirred opposition in cities across the country, but the dispute is especially acute in isolated towns with economies almost entirely based on tourism, creating crosscurrents unlike those found in larger, more economically diverse regions. In the isolated Eastern Sierra town of Mammoth Lakes, residents rebelled against short-term rentals, mandating voter approval of any changes to zoning restrictions on short-term rentals in residential areas. "It is anarchy out there right now," said David Wert, a spokesman for San Bernardino County. "All this unregulated and sometimes unsanitary activity that is having a huge impact on the community, the environment and the availability of housing for local residents." The county is drafting regulations to rein in the vacation rental market. Specifics being hammered out include, for example, what types of portable sanitation systems should required for businesses operating out of tents, Wert said. The ordinance is expected to be presented to the San Bernardino County Board of Supervisors for approval later this year, said Andy Wingert, the county's code enforcement chief. "We're already in the process of identifying sites that are manifestly unsafe," he said. "We will be sending out notices to make them stop." The ordinance can't come soon enough for residents struggling to cope with the influx of rentals they see as an assault on the environment, and a culture locals describe as "where hippie blurs to redneck." It has changed not just the attitudes but also the rhythms of the community. 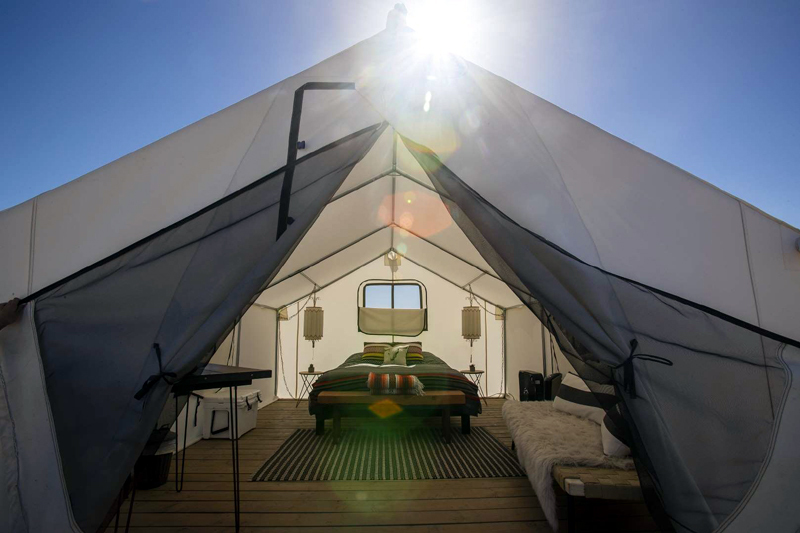 Lazy Sky Retreat has tepees that are spacious tents with electrical outlets, Western decor and doors facing the rising sun on May 15, 2018, in Joshua Tree, Calif. Lazy Sky is just one of Joshua Tree's estimated 800 unlicensed vacation rental businesses offering a menu of quirky alternatives to traditional motel lodging: neighborhood homes, vintage trailers, Sherpa huts, tepees, shipping containers, simply slabs of cement on which to pitch a tent or park a vehicle. "There's a heightened state of anxiety on holidays and summer weekends when loud parties rule the night," Grden said. "At sunrise, a battalion of carpenters, plumbers, painters and housecleaners arrives to fix what was broken the night before." "It may be too late to turn things around," he added. "The vacation rental industry has split this town right down the middle." On the other side of the issue are those who invested in vacation rentals, which can provide lucrative streams of income in a place where the median household income is about $34,000, compared with about $57,000 in the county as a whole. "I've got clients from San Diego to San Francisco who have bought second homes here just to rent them out," general contractor Mike Wilson said. "One of my clients is making $20,000 a month on two rental properties." 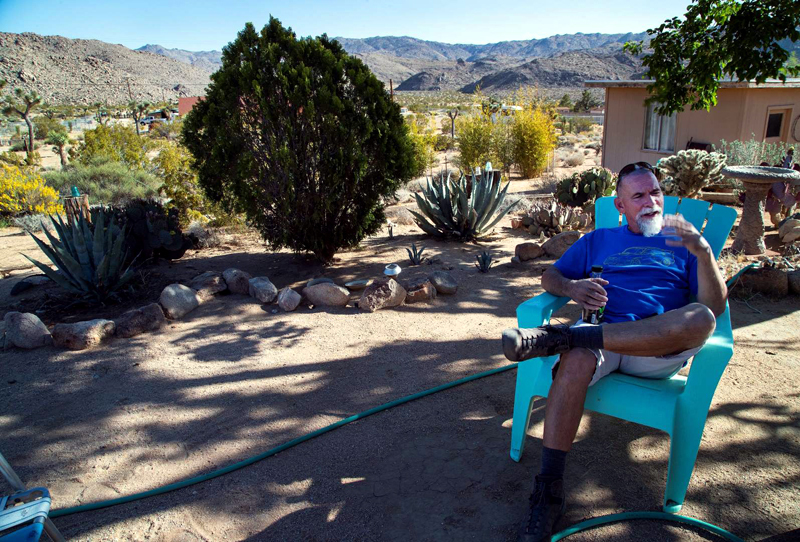 Mark Grdner of Joshua Tree, Calif., is a longtime homeowner who is surrounded by Airbnb's on May 15, 2018. "I used to sit out on the porch and watch bobcats creep past under skies filled with stars, bats and owls," he said. "Neighbors knew each other and kept an eye on each other's property. Now, I'm surrounded by Airbnb's filled with vacationing strangers who seem to think anything goes out here," he said, shaking his head. Real estate brokers say the first question asked by the Southern Californians who call them each day is: "Can I pick up a house there for about $100,000?" "I tell them the truth," said Bryan Wynwood, a real estate broker in Joshua Tree who owns a vacation rental in town. "The days of homes here selling for $60,000 to $100,000 are over - never to return. Today, entry houses are $150,000 to $200,000." 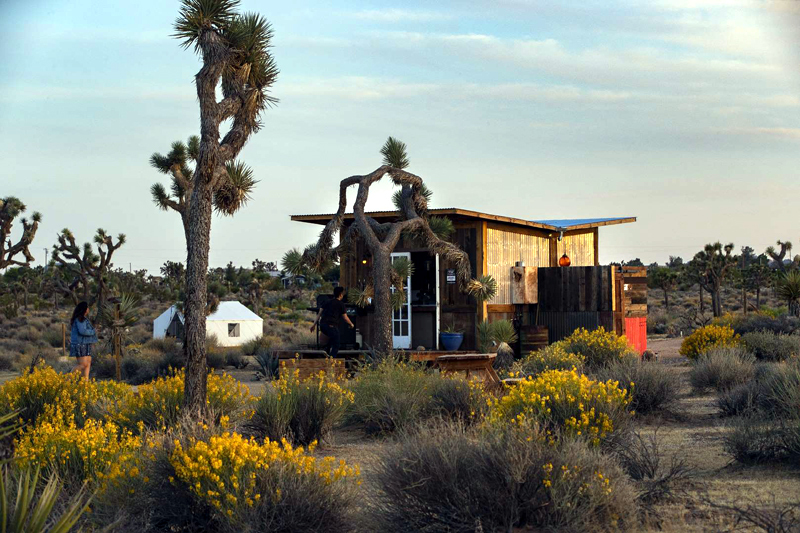 Shipping containers are a cheaper alternative in Joshua Tree's red-hot vacation rental market. Big Morongo Feed and Tack in Morongo Valley has always specialized in alfalfa pellets, chicken feed and exotic hens but is carving out a new niche business by offering 20-foot shipping containers for $2,900, including delivery. Shipping containers painted bright white and outfitted with showers and wooden floors are lodging at Moon Camp, a vacation rental site perched on a slope dotted with creosote on the northwestern edge of the national park. "It's quite livable," said Rosemary Quigley, 58, of New York, emerging from one of them on a recent weekday morning. "But it's kind of interesting coming all the way from New York to spend the night in a shipping container." Southern California's newest vacation boomtown is spread across washes and alluvial plains just north of the park, part of a necklace of communities that stretches 40 miles along California 62 from Yucca Valley to Twentynine Palms. The green house is an Airbnb as seen from Mark Grdner's front porch. 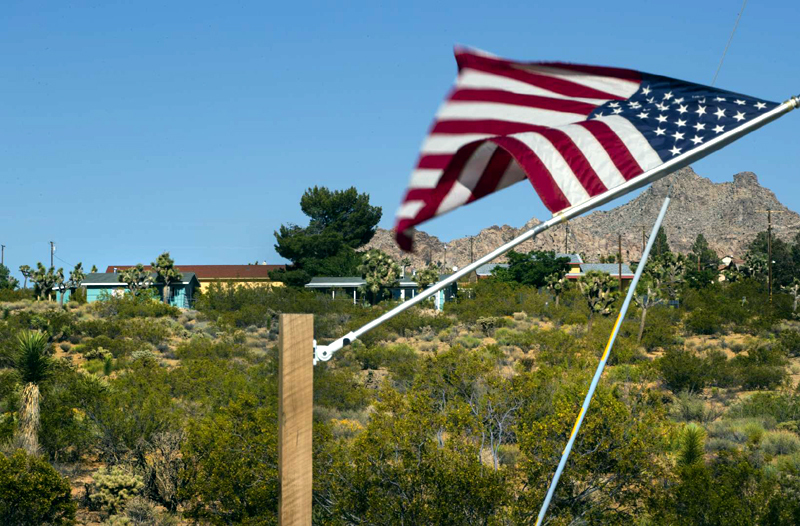 Grdner, a longtime homeowner, says he is surrounded by Airbnb's on May 15, 2018, in Joshua Tree, Calif. "I used to sit out on the porch and watch bobcats creep past under skies filled with stars, bats and owls," he said. "Neighbors knew each other and kept an eye on each other's property. Now, I'm surrounded by Airbnb's filled with vacationing strangers who seem to think anything goes out here," he said, shaking his head. Joshua Tree has seen changes before. It was settled by successive waves of people seeking jobs in agriculture, ranching and mining industries that flourished for more than a century. Today, it is a popular weekend destination for hikers, rock climbers and other visitors to the park, which like other federal lands in California is luring record crowds. Joshua Tree's status as a refuge for musicians and artists stems in part from the legend that followed the 1973 overdose death of singer-songwriter Gram Parsons in Room 8 of the Joshua Tree Inn. But it wasn't until about three years ago that the vacation rental market started booming, around the time the Coachella Valley Music and Arts Festival in Indio - about 50 miles away by car - started setting world records for attendance and gross revenues. The desert festival circuit arrived in Joshua Tree as well in 2016, with an event by a 77-year-old meditation retreat called the Institute of Mentalphysics that featured rapper Childish Gambino. Neighbors complained that concert sound rattled windows and lighting effects illuminated mountains miles away. Tony and Annie DeMille enjoy the late afternoon breeze at their Lazy Sky Retreat on May 15, 2018, in Joshua Tree, Calif. The pace of change has surprised even those in the vacation rental industry. Many rental owners have started buying adjacent undeveloped lots in hopes of sustaining a semblance of "open space" around their still illegal establishments. They include Hicksville Trailer Palace, advertised as a place where "the minute the gate closes, the experience begins. The desolate brown landscape of the Mojave Desert disappears" and in its place is a "bizarro desert wonderland" featuring small vintage trailers parked around "shockingly green astro turf" and a swimming pool. Like many other short-term rental owners, Morgan Night, who opened Hicksville in 2010, said he hopes "there's a path for Hicksville Trailer Palace to remain in the county" after the ordinance is implemented. A few miles to the west lies the 10-acre Lazy Sky Boutique Retreat, with outdoor showers, a communal kitchen and tepees, trailers and spacious tents with electrical outlets, Western decor and doors facing the rising sun. "Right now, we're totally illegal," said Annie DeMille, 37, who, with her husband, Tony, 48, invested about $100,000 in the business, which opened two years ago. "But we're determined to do whatever it takes to comply with the new ordinance." "Of course, there are no guarantees," added DeMille, who, like many other Joshua Tree residents, supplements her income by cleaning vacation rentals.